When packing for Cancun, make sure to bring reef safe sunscreen if you plan to get in the water—the biodegradable sunscreen brands keep the marine life safe. Many travel destinations have added biodegradable sunscreen brands to their list of necessities for participating in certain activities. Regular sunscreen has been linked to damaged coral reefs and is having a negative impact on sea life and their colorful homes. Make sure to find out if your destination or tour requires it, that way you can be prepared and buy it before you go—which can save you a little money too! Cancun Adventures is among those that ask you to consider the safety and preservation of marine wildlife by using reef safe sunscreen when getting in the water. 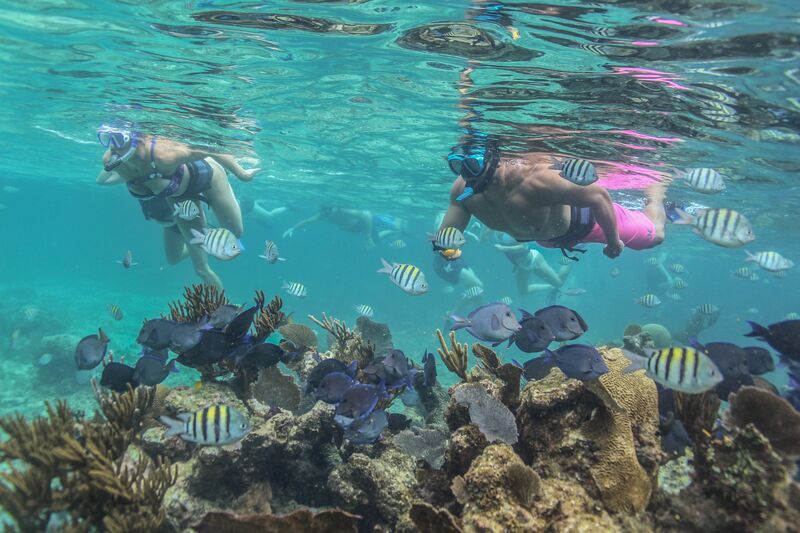 Most of the reefs, lagoons, and cenotes around Riviera Maya and Cancun are protected areas, and one of the first things you will hear is that swimmers must wear reef safe sunscreen. What is Reef Safe Sunscreen? Reef safe sunscreen, or biodegradable sunscreen, is more than just regular sunscreen in a biodegradable bottle. Reef safe sunscreen means that the sunscreen itself does not contain any chemicals that are harmful to the coral and other ocean life. Any time you participate in water activities, your sunscreen slowly washes off as it gets wet. Although it takes longer, even waterproof sunscreen contains chemicals that eventually wear off in the water and can damage undersea plants and animals. This makes it extremely important to choose a reef safe sunscreen to help protect ocean creatures and their homes. When Do I Need to Wear It? The short answer is that you need to wear reef safe sunscreen every time you get in natural bodies of water, like the ocean. Some examples of activities that require reef safe sunscreen include swimming, surfing, snorkeling, paddleboarding, and scuba diving. Most tropical locations like Hawaii and Mexico are now strongly encouraging or enforcing travelers to use biodegradable sunscreen brands. Because of the negative effects that regular sunscreen can have on coral and other ocean species, some tour companies or resorts may even confiscate your sunscreen if it does not meet their safety standards. What if I Burn Easily or Have Sensitive Skin? The good news is that reef safe sunscreens are just as effective as the brands you have used in the past. Some kinds are thicker or dry faster than regular sunscreens, but there are several varieties from which to choose. Similar to other products, if you follow the directions for application you will be effectively protected from harmful UV rays and sunburn. As with any skincare product, if you have allergies or sensitivities, consult with your dermatologist to find the biodegradable sunscreen brands that are best for you. In fact, PABA, a common ingredient in non-biodegradable sunscreens, is a common trigger for skin allergies, so switching to a coral friendly sunscreen may even provide benefits for your skin. There are quite a few biodegradable sunscreen brands available on the market, so don’t panic or do anything crazy like stop wearing sunscreen altogether. It may take a few extra minutes to check labels, but it’s surprisingly easy. You also may have better luck finding reef friendly sunscreen online or in health food specialty stores. Check out the list below for some of the top-rated biodegradable sunscreen brands available. Now that you know what kind of sunscreen to pack for your upcoming trip to Mexico, take some time to plan an exciting adventure or guided tour to make the most of your vacation. Cancun Adventures offers private and non-private tours to some of Mexico’s most exciting beaches, landmarks, and hidden historical gems. Check out all of our exciting tours and start planning your dream vacation today!